The paleogeography of the Barranc de la Boella site is related to lower Francolí river valley. The lower Francolí river valley contains the Gavarres interfluve which separate the terrace system of Middle Pleistocene age (T +30 m to current flood plain elevation) from the terrace system of Early and early Middle Pleistocene age (T+70 to T+40) (figure 1). The memoir of the second geological map at Tarragona area (1:50000) describes a fluvial terrace of + 60 m of elevation. 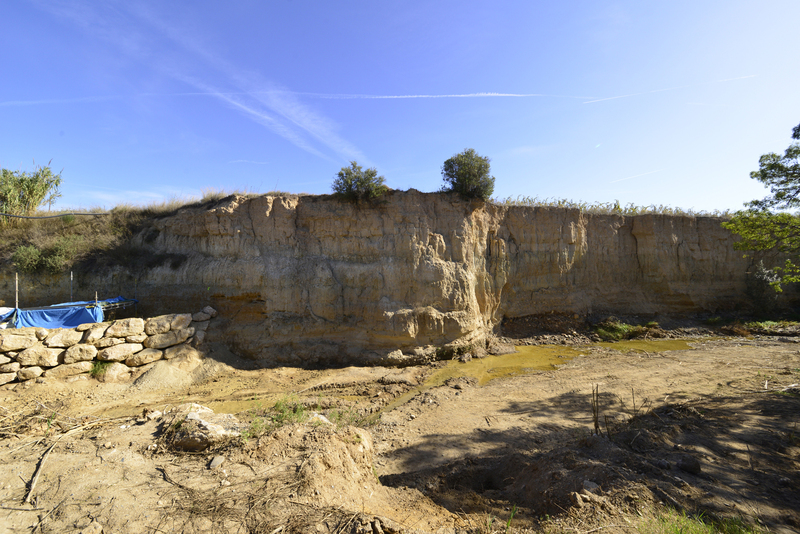 Field observations in gravel quarries near the Gavarres interfluve, between the Constantí and Canonja villages, confirm the existence this fluvial terrace system of Early Pleistocene ages. Geomorphological researchs and lithostratigraphical studies evidences shows that the Early Pleistocene terrace system is partially buried by Middle Pleistocene distal alluvial fan facies and continues to Pineda coastal area near the Salou Cape. The Barranc de la Boella stratigraphy reveals a sedimentary succession related to a incised valley fill in the Francolí river terrace of +60 m. The Barranc de la Boella record becomes form three main localities: pit 1, la Mina and el Forn. Six lithostratigraphic units mesures 9 m in the locality type of la Mina. Lithostratigraphic units II and III contains inverse polarity and their biostratigraphy contains Mammuthus meridionalis, Mymomis savini and Alophaiomys Chalinei. The reverse polarity correspond to late Matuyam chron. Cosmogenic dating from unit II samples at la Mina and el Forn localities offer a date of 1 ±0,06 Ma. The Barranc de la Boella archeo-paleontological record consist in faunal, vegetal and lithic industries. The vegetal and faunal remains conservation is related to fluvio-deltaic colapses on the miopliocene semigraben of the Gavarres. Faunal association and sediementary facies associations point out fan delta depositional setting and flooded habitats. Lithics industries assemblages suggest one of the first apparitions of the large cutting tools in Europe. Future challenges in the Barranc de la Boella site research deals with findings dating to early middle Pleistocene and Early (before Jaramillo magentic episode) Pleistocene. Future geomorphological and archeological surveys will confirm this oportunity in order to explore the origin of human occupation of the Europe.